Northampton Saints flanker Scott Gray was born in Salisbury, Rhodesia (now Harare, Zimbabwe) and moved to Australia aged 18. After spending two years in Canberra with the Brumbies academy he won a development contract with a view to playing in the Super 12. 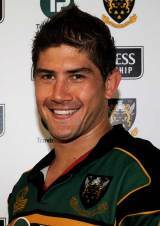 Gray chose to switch codes however, and enjoyed a spell playing rugby league with Brisbane Broncos before joining Bath in the Guinness Premiership. From Bath Gray joined Border Reivers, playing for the side until they were disbanded by the Scottish Rugby Union. Gray then joined English National Division One side Doncaster before steeping up into the Premiership again with Northampton at the start of the 2008-09 season. He won his first Scotland cap against Australia at Murrayfield in 2004, but would have to wait four years for his second chance on the international stage when, rejuvenated by his move to Northampton, he was called into Frank Hadden's squad for the autumn internationals. Gray added three caps as a replacement against New Zealand, South Africa and Canada.